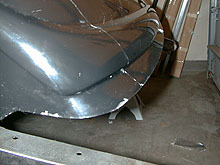 There's a lower lip on the body that on an original 1933 Ford was used to mount to tank cover. 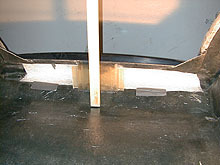 The plan I have in mind calls for the body to be finished right below the body reveal, just above the tank cover mount. 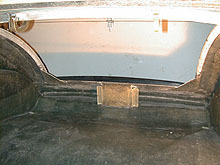 This is where the floor and body come together. 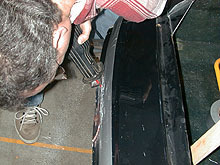 Some extra fiber glassing was done first to ensure the integrity of the body after removing the 1 1/4-inch lip. Joey Keyman stopped by again to help out. I'm starting to tease him that he's enjoying the fumes. 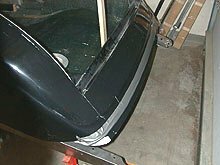 We mixed a few batches of resin in the trusty paint pan and laid down for layers of glass mat and cloth across the back of the car from side to side. 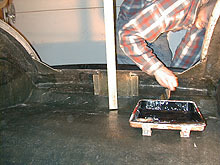 Again we applied to resin just as we did in earlier fiber glassing articles, using a brush and daubing the mat in place. We laid down a first layer of mat, then 2 layers of cloth, followed by a final layer of mat. Here you see the finished product. When dry you can hardly tell it from the original glass. My brother looked at it today and asked when we're going to glass that area. Once the glass was dry it was time to make the cut. I laid down three layers of duct tape as a cushion for the saw. As I made my cut I was careful to leave about 1/8 inch so I could use my sander to do the final smoothing.